I caught up on Grey's through my Netflix subscription, then once I got current I caught a few episodes on ITunes, then Tivoed. I watched ER from the beginning through Netflix too. I seem to never watch shows when they're "actually on TV"!! Ahhhh....yes. Greys. 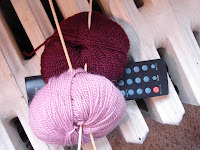 What you need to do is have a "mindless" knitting project at hand when you watch Greys'. Because, then you feel useful doing an un-useful thing - watching Tv. That is what I do and that is how I justify it! I love the show. Addicted from the start.